Cook the fettuccine until “al dente”. Meanwhile, melt the butter and garlic in a large sauce pan, and add the cream slowly (make sure cream has been out of frigerator for about 10 minutes) then add wine, parmesan, salt and pepper to taste. Stir over medium heat till cheese has melted and sauce has thickened. Add drained, cooked pasta to sauce, stir till coated. Place on a large pasta platter and add fresh parsley, ground pepper, and grated Parmesan cheese. Serves 4. 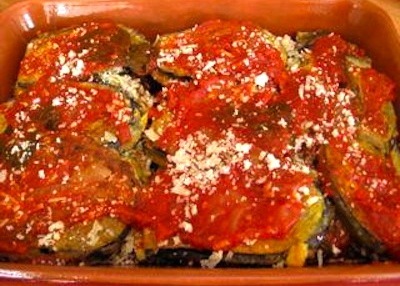 1 large eggplant-sliced, 2 tbsp coarse salt, 2 jars tomato & basil sauce, 3 cups Antica extra virgin olive oil -for frying, 12 oz, Bufala Mozzarella cheese (thinly sliced), 2 1/2 cups grated,Parmesan or Romano cheese, 1/2 tsp. oregano and rosemary, 1 large minced garlic clove. Peal the eggplants and cut in 1/4 inch thick slices and sprinkle with coarse salt. Place in a colander and weight with a heavy dish. Leave for at least 1 hour for eggplant to drain. Pat dry with paper towels. Heat olive oil in a large sauté pan and fry eggplant till golden brown. Drain on paper towels. Cover bottom of casserole dish with tomato sauce, layer eggplant, a layer of Mozzarella, grated cheese, a little bit garlic and spices. Repeat until you have several layers of each. Reserve a little tomato sauce and grated cheese for top. 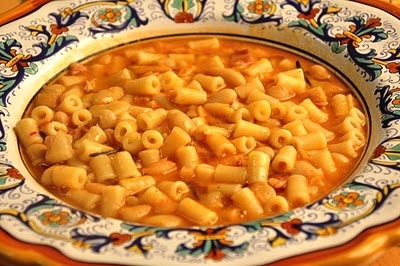 Ingredients: 2 tablespoons ANTICA extra virgin olive oil; 1 large onion, diced; 1 can ANTICA cherry tomatoes; 1 can cannellini beans (white beans); 2 cups plain water, 1/2 cup Pasta di Gragnano (Ditali), 1 cup freshly grated parmesan, dried parsley, salt and pepper, 2 garlic cloves chopped, 1 tsp. dried basil, 1/2 tsp. dried oregano. Purchase Balsamic Vinegar from our store! Yield: Makes 24 small slices. Fun Facts About Italy. Bet You Didn’t Know! Almost 20% of Italy’s population is over 65 years old. Italy borders Austria, France, Vatican City, San Marino, Slovenia, and Switzerland. The average Italian family has 1.27 children. Everybody 18 and over can vote, however you have to be at least 25 to vote in Senate elections. The Italian flag is inspired by the French flag introduced during Napoleon’s 1797 invasion of the peninsula. Italy’s unemployment rate is around 8.6%, but it is as high as 20% in the more impoverished south. 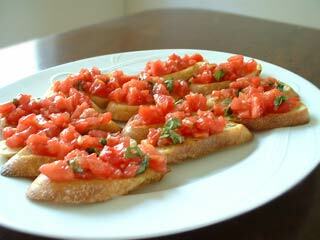 The average life expectancy at birth for an Italian is 79.54 years. The famous children’s story, Pinocchio , was written by an Italian. The city of Naples gave birth to the pizza. Italy’s contributions to science include the barometer, electric battery, nitroglycerin, and wireless telegraphy. Today’s modern Italian language originated in the region of Tuscany. Italy is home to two microstates, San Marino and Vatican City . Cologne came out of Italy. San Marino, the capital of San Marino Republic. Mt. Vesuvius last erupted in 1944, destroying a number of neighboring villages and the city of Pompeii. Italy has 16 regions and 4 autonomous regions. Italy is the world’s seventh largest industrial economy. With over 5 million people, Rome is Italy’s largest Italy. Italy has a population of over 58 million. Every kid between the ages of 6-14 go to mandatory school. More than 90 percent of them attend public schools considered better for learning than private schools. An engineering marvel of the ancient world, Cloacus Maxima, is the sewer of Rome. The first Roman Emperor was Augustus Octavian, who came to power in 27 BC. A Roman Centurion commanded 100 hundred men. The Italian Republic does not have an official motto, but it does have a common phrase: “L’Italia e’ una Repubblica democratica, fondata sul lavoro” (Italy is a democratic Republic, founded on labor). St. Francis of Assissi and Saint Caterina of Siena are the patron saints of Italy. Italy has two large islands, Sicily and Sardinia , as well as a number of smaller islands. The Alps mountain range form part of Italy’s northern border, and for a long time, protected the peninsula from invasion. Next to Rome, Milan is the second-largest city in Italy. Florence is home to Italian art. A vespa is an Italian-made motor scooter that many people ride around busy city streets on. frankdelia on Fun Facts About Italy. Bet You Didn’t Know! Arnette on Fun Facts About Italy. Bet You Didn’t Know!